Fall is a favorite time of year for many people in Wisconsin. It’s a great time of year to get outside, enjoy the crisp fall air and beautiful fall foliage. But don’t neglect preparing your property for the coming cold. Detach outside garden hoses. Empty any remaining water out of the hose and store it in your basement during the cold winter months. Hoses left outside can contain water. When that water freezes, it expands and can burst the hose which means you may have to buy another come spring. Close the inside shut-off valve(s) for your outdoor faucet(s) and then drain any remaining water in the fixture(s) before it freezes. This is important because trapped water that freezes can damage both the fixture and the shut-off valve. Damage to pipes and fixtures can be costly to repair. If you have a pool: Clean, Close, and Cover it for the winter – or call a professional to do it for you. Rake fallen leaves. A thick layer of leaves can smother your lawn. Check with your local municipality to find out about fall leaf pickups. Some communities are now recommending mowing leaves to break them down instead of bagging them. In Milwaukee, you have until November 15th to rake your leaves into the street for sanitation crews to pick up. 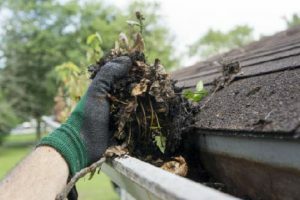 After the leaves have fallen, get your gutters cleaned and inspected. While they’re up there, they should check your roof for any damaged shingles. It’s best to get these things repaired before the snow starts to fall.